The Calgary Flames came into tonight hoping to play spoiler. Unfortunately, they couldn’t quite pull it off. The local hockey club dropped a 5-4 overtime decision to Darryl Sutter’s Los Angeles Kings in the second-to-last home game at the Scotiabank Saddledome this season. They played fairly well, but a few old habits crept in and cost them when it counted. The first period wasn’t all that good, in that it lacked flow. Neither team played great, and each team scored a bit of a weird goal. The Flames struck first, as Mikael Backlund attempted to feed the puck to the slot…only for it to careen into the open net off of Anze Kopitar’s skates. Whoops! That made it 1-0. But the Kings responded back: the Flames defenders knocked the puck away from a streaking Kopitar, but Milan Lucic collected the puck and beat Joni Ortio with a quick wrister to make it 1-1. (The defense was good, but I don’t think Ortio expected the shot.) Shots were 12-4 for the Kings, who also held a sizable 23-14 shot attempt edge. The Flames were much better in the second period, but got caught flat-footed early. After Ortio made the initial save off Kopitar but the rebound went right to Lucic, who buried his second of the game. The Flames hung around, though, and eventually got chances – particularly late in the period – but the Kings tried to keep them to the outside. The Flames finally broke through, as after a few whacks at a loose puck off an initial drive by Monahan, Hunter Shinkaruk (playing his first NHL game in his hometown) jammed in the loose puck to tie it up at 2-2. Shots were 12-4 Flames in the second, and they also held a 21-15 shot attempt edge. It was very much the mirror image of the first period (and a much more entertaining 20 minutes of hockey). The third frame was the best and worst of the 2015-16 Flames. They got an early power-play goal off a nice wrister through traffic from Mark Giordano to give them a slim 3-2 lead, but the lead was frittered away just 32 seconds later off a failed clearing attempted that bounced all topsy-turvy around the Flames end before going past Ortio off of Andy Andreoff’s stick. The Flames kept pressing late, and after an offensive rush led by Jakub Nakladal of all people didn’t generate a dangerous chance, Deryk Engeland (!) rushed in from the side boards and beat Enroth with a nice wrister to make it 4-3. But that lead didn’t last, as the Flames didn’t really touch the puck from that point onwards, allowing Kris Versteeg to score off a scrambly play with 35 seconds left to send the game to overtime. Shots were 9-7 for the Kings, and they had a pretty hefty 26-11 attempts lead as well. Jeff Carter scored 40 seconds into overtime with a shot that just squeaked through the wickets of Ortio to end this game. The goal was on the only shot (or attempt) of the overtime period. The Kings kept giving the game to the Flames, but the Flames just weren’t crisp enough to take it from them. They had plenty of opportunities on the power-play and throughout the game here and there at even-strength, but they weren’t opportunistic enough offensively or sharp enough defensively to hold off Los Angeles when it counted. And let’s be honest here: that’s why they’re not in the playoffs this season. Ortio was so-so. He allowed five even-strength goals, which is never a recipe for success. Let’s go with the hometown boy, Hunter Shinkaruk. He was full of energy and had a big goal on home ice. Also good this evening were “Point-Per-Game” Johnny Gaudreau (two assists, to reinstate his point-per-game pace), Joe Colborne (two assists) and Mark Giordano (a goal and an assist). Giordano’s goal was his 300th career point, which pushed him past Willi Plett and into sole possession of 19th-place in Flames franchise scoring. Backlund’s goal, his 18th of the season, ties his career high in goals. 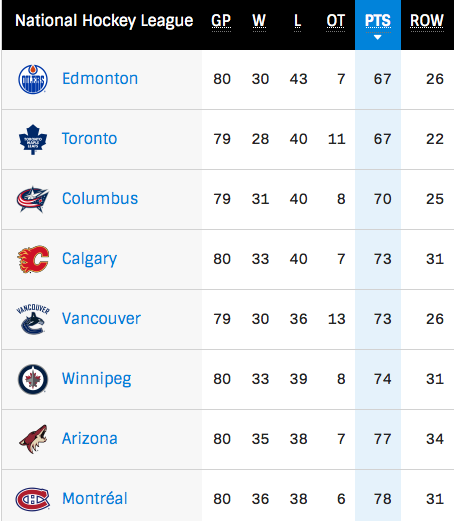 The Flames can’t finish last and they can’t finish 29th, but everything else is still in play. The Flames end their home schedule with a crucial tank battle on Thursday evening against the hated Vancouver Canucks. No love for Engelland? He also had a goal and an assist. Thought he played well tonight. Do you want to make the team next year Shinkaruk? That’s how you make the team next year. Really digging Shinkaruk. I know it’s the end of the season, and it remains to be seen if he can sustain this performance, but he doesn’t look out of place at all on that top line. I’d be happy to see this line next season. Maybe Shink just despises the Nucks like a good Calgary kid should. On a different note, that video… Awesome. Best show ever. Big props to Ryan! Omar!! !